Likud ekes by Labor, Jewish Home down to 11 seats being bypassed by joint Arab list and Yesh Atid, dropping to 5th for first time. It's poll time again as Israel continues to ramp up ahead of the March 17 elections, and in the latest findings Likud squeaks past the "Zionist camp" of Labor and Hatnua, while Jewish Home falls into fifth place for the first time in this election's polling. 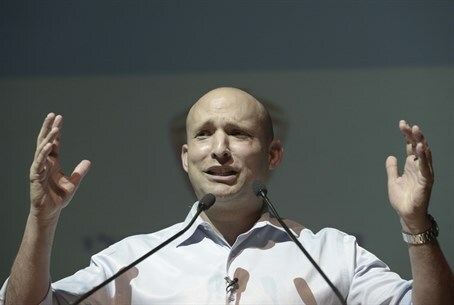 According to the Maariv poll published on Friday morning, Likud gets 24 mandates just barely squeaking by Labor's 23, and thereby getting first crack at forming a coalition government. Jewish Home falls from the third place which it has held in nearly all polls, being replaced by the joint Arab list composed of the four Arab parties which gets 13 seats. Yair Lapid's Yesh Atid also outpaces Jewish Home, coming in at 12 seats in a considerable improvement from its recent polling results. For its part, Jewish Home comes in at 11 seats, one less than it got in the last elections. The result is a drop back from the slight increase to 13 seen in Thursday's poll, which was itself a far cry from the 15 to 17 seats given in polls just a few weeks ago before the downward trend since the placement of former soccer player Eli Ohana. Moshe Kahlon's new Kulanu party gets seven seats according to the poll, as does United Torah Judaism. Shas, the radical leftist Meretz party, and Yisrael Beytenu get six mandates apiece, and Eli Yishai's Yachad - Ha'am Itanu joint list with Otzma Yehudit gets five seats, handily passing the threshold percentage by a wide margin.